Number of Speakers How many bookshelf speakers are included? Indoor or Outdoor Use Can the speaker be used outdoors? Tweeters produce the highest frequencies in sound, typically anything above 2,000 Hz. Usually located at the top of the speaker, tweeters come in different shapes (detailed below) and sizes. Generally speaking, the size of the tweeter is not as important as the shape. But, for some guidance, consider that a larger tweeter (measured by diameter in inches or millimeters) will likely be louder and able to disperse sound over a larger area. Speakers with midrange drivers (i.e., at least three-way speakers) have a distinct advantage over two-way speakers. Adding a midrange driver to the mix allows tweeters and woofers to focus on the sound waves they’re best equipped to produce—high tones and low tones respectively. More specific and focused drivers means more accurate, robust sound. Compared to the other drivers, midranges cover sounds, not surprisingly, in the middle of high/treble and low/bass tones. The human voice and most instruments fall into this range. For more sophisticated listeners, or for those who truly want the best sound reproduction, a midrange driver is crucial. The woofer is the driver that is responsible for low frequency sounds and bass - crucial for well-rounded, booming sound. It is the biggest driver in size, and is usually shaped like a cone. When reviewing different bookshelf speakers, you will often see a measurement in the product name, starting as low as 4” and ranging to 6 ½” or more. This measurement refers to the diameter of the woofer. A general rule of thumb is a bigger woofer means louder, more powerful bass. But, as with any speaker metric, this number alone doesn’t describe the loudness of the speaker and should be taken into consideration with other measurements such as sensitivity, which describes the loudness of a speaker per watt. Remote Control Does the box include a remote? Button Controls Control the speaker with buttons on the device. Rank: #4 out of 124. Additional Features Any other features available. 4-inch bass drivers in each speaker. Fully featured inputs for HD audio. Button controls for treble, bass and volume knobs. 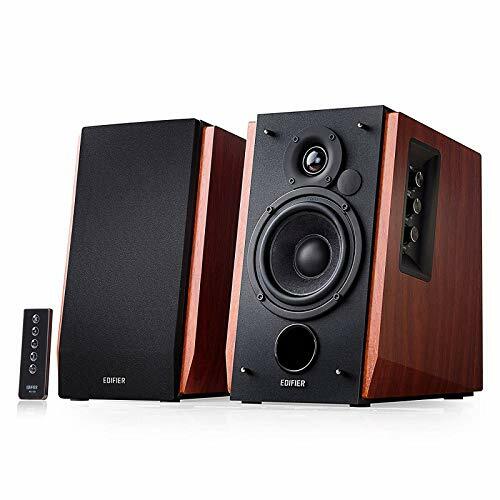 Edifier R1700BT are a very popular and one of the less expensive options. 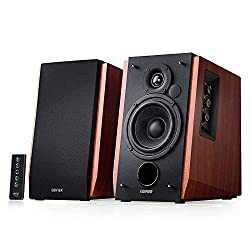 They're in the top 3 bestselling speakers and have dozens of popular alternatives in the same price range, such as Klipsch R-15M or Pioneer SP-BS22A-LR . Edifier R1700BT are $50 less expensive than average speakers ($199.99).